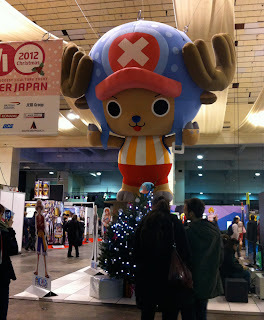 Today, we went to the Hyper Japan Christmas exhibition in London. 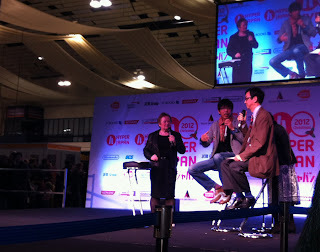 Billing itself as "the UK's biggest J-culture event", the show has moved to the Brompton Hall at Earls Court this time around and runs from Friday 23rd until Sunday 25th November 2012. I must confess that I avoided the event in previous years as I felt it was marketed heavily towards a younger demographic; it came off as being even more focused on cosplay, fashion and exhibitionism than London Expo. This time though, the organisers outdid themselves and put together a schedule which included plenty of content for the less trendy fans as well as the cosplay demographic. They also did the impossible and arranged some legitimately famous Japanese guests, including the famous musician Hotei Tomoyasu on one of the dates! My curiosity eventually got the better of me and I decided to pop in and see for myself whether Hyper Japan was worth visiting. There was still plenty of fashion and glitz in evidence, padded out with things which were more interesting to me. I think anyone with even the slightest interest in Japanese culture would have found something they could enjoy at this year's Hyper Japan. It was like a geeky version of Japan Matsuri. After some initial irritation with the ticketing service (they add payment processing fees and booking fees during the checkout process, so the savings on the advance tickets are nowhere close to being as significant as advertised), we received our advance tickets by text message - a first for me, and very convenient as I have no printer. Or so I thought until I arrived at the event, where it transpired that they had no way to scan the text message tickets and users were instead required to complete forms vowing that they were the person who had bought them while the people with paper tickets breezed through a fast-moving queue. In spite of this hiccup, it wasn't long before we were in and the queueing process was overall much faster than London Expo. There weren't very many cosplayers in the morning so the handful of people who had dressed up really stood out. Unlike Expo, where the atmosphere tends to be extremely bubbly and cardboard weapons are waved all over the place, the cosplayers at Hyper Japan seemed content to stroll around like normal attendees, saving their photo opportunities for areas out of the way of the crowds. One particularly eye-catching costume was a young man who had dressed up as Belle from Disney's Beauty And The Beast. Although he was clearly not female, he looked great in that ballroom dress! I wanted the cook to be Muneshige. Conscious that the stage events were about to begin, we quickly looked around and became hungry enough that we decided to miss the first few minutes of the performances and get some breakfast. The food hall area was brilliant. It was made up of a large number of tiny vendors arranged like a Japanese festival eating area, with plenty of tables and chairs around the perimeter. 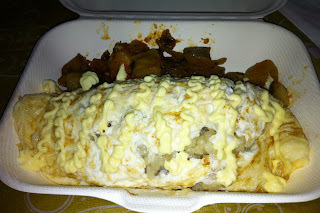 There was an abundance of takoyaki, okonomiyaki, curry, onigiri, donburi and every other conceivable staple. On the fringe of the main food stalls were vendors selling desserts ranging from shaved ice treats to exotically-flavoured Kit-Kats. I must confess that my choice of breakfast was slightly silly. As I walked through the stands, I noticed one with a neat, tidy price list which not only listed vegetarian options at the top, but also specialised in omrice. I love omrice. 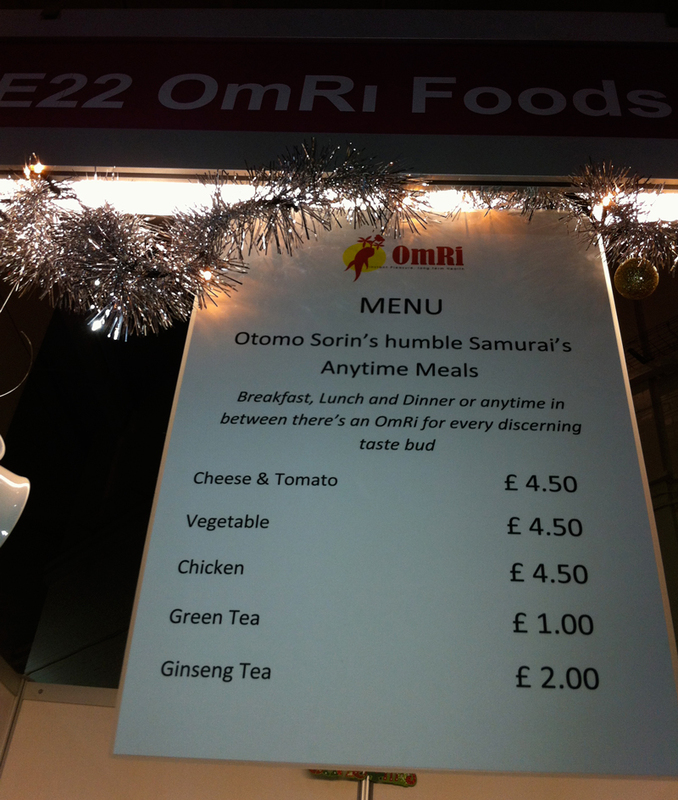 As though these two factors weren't enough, the stand, OmRi, went the extra mile and billed itself as "Otomo Sorin's Humble Samurai's Anytime Meals". Unable to resist, I hurried over and purchased a serving of fresh-cooked vegetable omrice. I was issued with a survey which included a fantastic sengoku-era story which entertained me so much I took it home and kept it. Omrice. Scrumptious. Difficult to photograph. Unfortunately the blurred picture isn't much to look at so you'll have to take my word for how gloriously the gooey egg and rice blended together. The rice was mixed with mushrooms (the proprietor mentioned garlic butter too), and the vegetables were tasty. I stuck to mayonnaise; additional toppings were available for more adventurous people. It was a warm, satisfying start to the day. Once we were finished with breakfast, we drifted towards the main stage. Rather generously billed as a 'J-pop veteran', Beckii Cruel was performing some dance routines when we arrived (we'd apparently completely missed her friends 'Oishii Ichigo'). She looked good in her outfit; I have to admit though that mimed karaoke dance routines aren't really my thing, with apologies to the UK pop music industry. Once Beckii had finished, the extremely outgoing Suzuki Naomi took over. It wasn't long ago that we watched Naomi presenting Japan Matsuri and she was in fine form today, belting out two songs while dancing her heart out. She's a great singer. I was tempted by the next stage performance, some swordplay courtesy of KAMUI, however my partner wanted to visit the traders before the crowds worsened so we decided to spend the next couple of hours on the show floor. Both of the Japanese singers had arranged for CD versions of their original songs to be available from JP Books at the show, so we paid them a visit. It was incredible how many people were packed into the JP Books booth! They were selling a variety of items on top of the Japanese and English books/manga. I noted that they had the Sengoku Basara Battle Heroes Official Complete Guide on the shelves. It was slightly out of my price range. 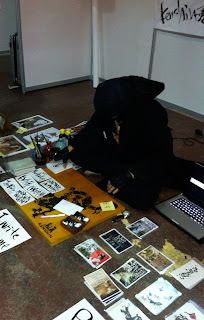 One table was covered in fashion magazines and that in particular was attracting a lot of people. They'd also brought some Blu-ray releases from Japan which happened to have English subtitles. The hat on top of the tree was a nice touch. One of the main things we'd planned to do was to visit Toei Animation who supposedly had representatives at the show. Toei have been attending a lot of trade fairs this year to promote One Piece even though the series has never been licensed here in anime form and Shonen Jump Alpha is US-only. We had several questions for their representatives only we didn't see a trace of them all day! We did, however, find their stand, which was right at the entrance and decorated to attract as much attention as possible. As well as the colossal Chopper, there was a One Piece Christmas tree decorated with mugiwara pirates and a pile of presents wrapped with One Piece ribbons. Stickers and balloons were also available so we helped ourselves. Unlike Expo, which seems to arrange the booths at random, there was clearly a degree of organisation at Hyper Japan. The venue was quite small and could easily be traversed in a couple of minutes; nevertheless, the vendors were clumped together tidily. There was an area devoted to fashion accessories and kimono, another for character goods, an aisle for tourism organisations, a gaming area and a collection of booths specialising in handicrafts. 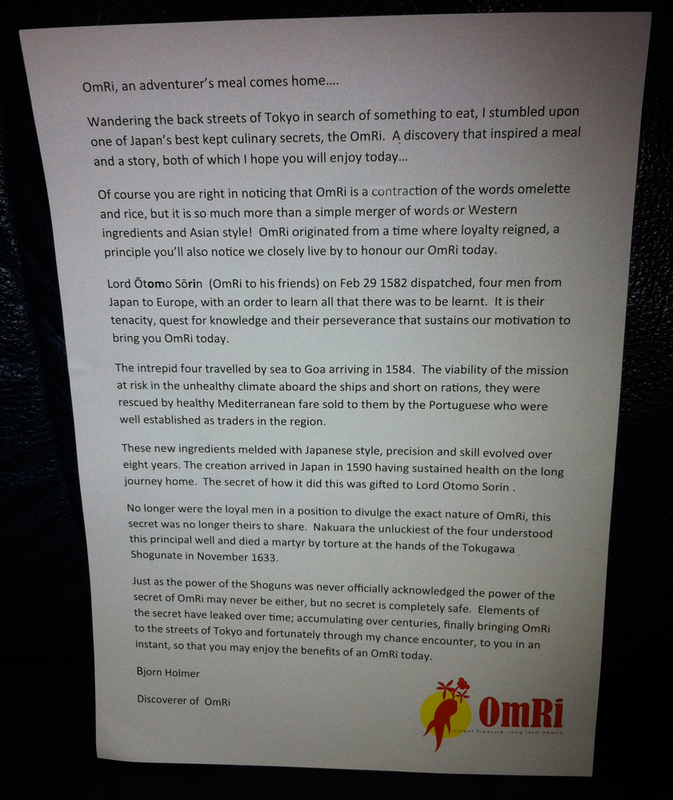 Even the two big anime retailers Otaku.co.uk and United Publications were opposite one another. This made walking around the floor extremely straightforward. He had a fantastic writing board. Another thing I noticed about the vendors was that there was far less of the piracy which London Expo is blighted with. There were one or two suspicious items, but the vast majority of goods were either handmade or direct Japanese imports. I suspect that there will be complaints from some attendees that prices seemed higher than they'd usually expect; they won't realise they're usually being ripped off with bootleg merchandise at lesser events. 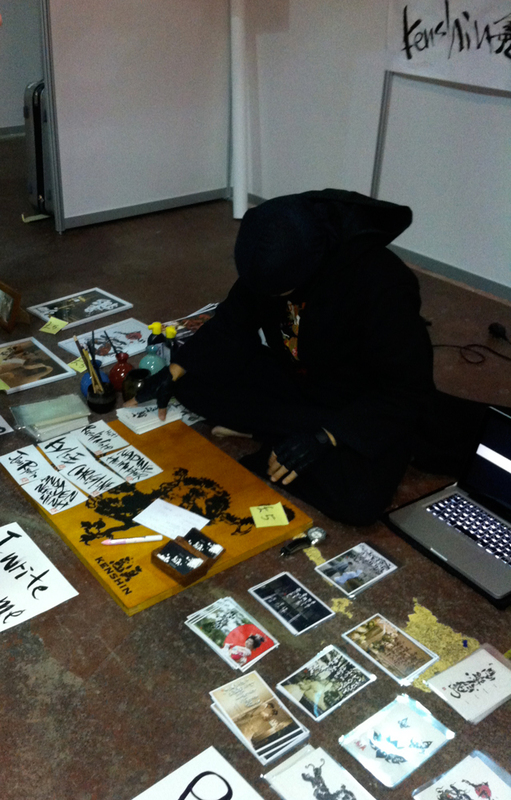 Memorable booths included a mysterious laptop-using shinobi who was writing English words in calligraphy upon request (pictured). A wrapping service offered visitors the opportunity to have anything they purchased at the show beautifully wrapped up, Japanese-style, ready to use as a Christmas gift. Specialist bakery Wagashi was also present with a new product: red bean and walnut dorayaki. Delicious. Namco Bandai Europe had a large booth and the preview of January's Ni No Kuni seemed popular, as did the demo stations set up for One Piece: Pirate Warriors (Kaizoku Musou). Sake tasting and live cookery classes meant that older men and women were getting genuinely excited themselves accompanying their loved ones to the event. Hosting such a diverse selection of activities definitely paid off. 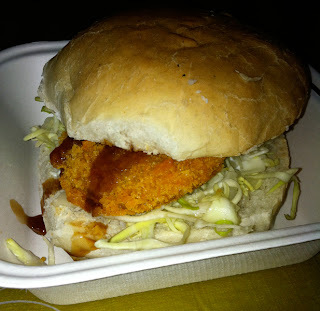 Pumpkin croquette burger. Tasty despite the bad photo! After visiting all of the stalls we'd wanted to see, we grabbed some lunch from the packed food court and headed back to the main stage. Upon arrival we caught the end of 'Christmas Nibbles: Japas, Japanese Style Tapas', which was a live cooking show helmed by Ikeda Atsuko. She was teaching a heaving crowd how to make curry dumplings, and also how to present them attractively for a party, which I thought was nice touch. There were even samples for the lucky audience members closest to the stage! The next event was the one I'd most been looking forward to; a discussion with Ishikawa Mitsuhisa (head of Production I.G.) and Hikawa Ryuusuke (a Japanese anime critic) as part of the Japan Media Arts Festival. Ishikawa was on the production team for the anime version of Sengoku Basara, which is reason enough to be interested. His studio is also behind a huge number of other successful works and anything he had to say about anime was bound to be worth listening to. I was hoping that Kick-Heart project would also be mentioned and that he'd see how popular his productions are with fans in the UK. Although I was not familiar with Hikawa previously, a film critic was an interesting choice to balance the discussion. Popular UK anime personality Helen McCarthy acted as the MC. Ishikawa Mitsuhisa and Hikawa Ryuusuke. Surprisingly, Kick-Heart wasn't mentioned at all; this might be in part to the panel blazing through its allocated timeslot more swiftly than expected. One complication which I'd wondered about yet not properly considered was that the two Japanese guests had to use an interpreter. This meant that less ground was covered in the panel than would have been ideal as it took time for all of the responses to be translated. I'd love to see the pair of them talk at length at future events! The speakers still provided plenty of entertainment for their rapt audience, with noticeable cheering when Hikawa mentioned his excitement at staying in a London hotel which had been shown in the K-On! movie. Helen is a natural in the MC role, taking care to impress upon the guests how it can be challenging for UK fans to see foreign theatrical movies with relatively little support over here, while assuring them that there were a lot of passionate fans for all kinds of series. The other treat for the crowd (which had grown to completely fill the surrounding aisles by this time) was a screening of the full version of Production I.G. 's animated short NEXT A-Class, created with Mercedes Benz. Even though this was a six minute long car advertisement, the quality of its production and the booming audio at the venue had everyone on the edges of their seats. Featuring big names such as Sadamoto Yoshiyuki and Kawai Kenji, the ad was definitely a hit. There was only enough time left for three questions from the audience. The first was about whether Production I.G. would be considering any additional animation work for the Tales series of games, and the third was whether fans could expect any future Ghost In The Shell projects. Both of these questions were answered the same way; of course they couldn't announce any information that hadn't been formally released. The other question was whether projects such as the anime adaptation of Sengoku Basara come about by request from the game companies or whether the anime company itself approaches the makers. Ishikawa responded that in the case of Sengoku Basara, it was Production I.G. which approached Capcom initially as they felt it could be made into an interesting animated series. So I guess I know now who it is that I should be begging for another season! Once the panel finished, I decided to retreat in my embarrassment and we headed off back home, with a short detour to central London first to pick dinner up from Umai at the Japan Centre. They have launched some new varieties of sushi! I picked up furikake mash potato rolls (which were pleasant) and aubergine along with some other groceries. Surveys were a running theme at Hyper Japan. I was asked for my opinion on all kinds of things wherever I went and I'm always extremely forthcoming! Many offered rewards and prize draw entries in return. Here's a picture showing some of the goodies I picked up. In the bottom right is a piece of calligraphy created by UK-based artist Takako Higgs on some canvas. She warned me that using traditional ink on canvas would be difficult; I think it turned out nicely and I respect her for accepting my weird word choice. In the top left is a clever plastic document bag that can be transformed into a clear file once you take it home. 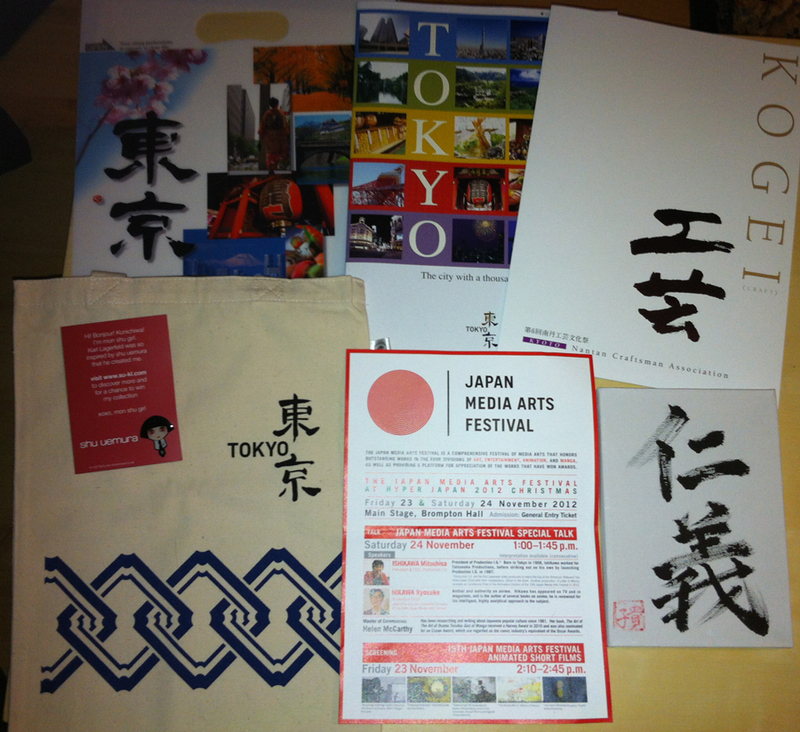 We also received a free pin badge and a canvas bag. The best freebies came from the tourist agencies. And here are my premeditated purchases. 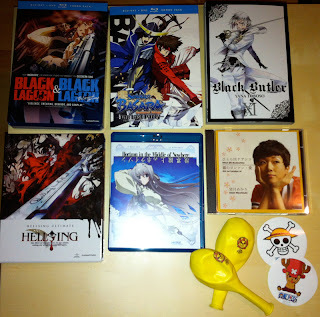 A few anime series from the US, namely the recent Blu-ray sets for Black Lagoon, Sengoku Basara -The Last Party-, Horizon in the Middle of Nowhere (Kyoukaisenjou No Horizon) part one and Hellsing Ultimate parts V-VIII in a limited edition box. I also picked up the latest volume of the Black Butler manga and Mochizuki Akari's CD single, Hitori De Nadeshiko. 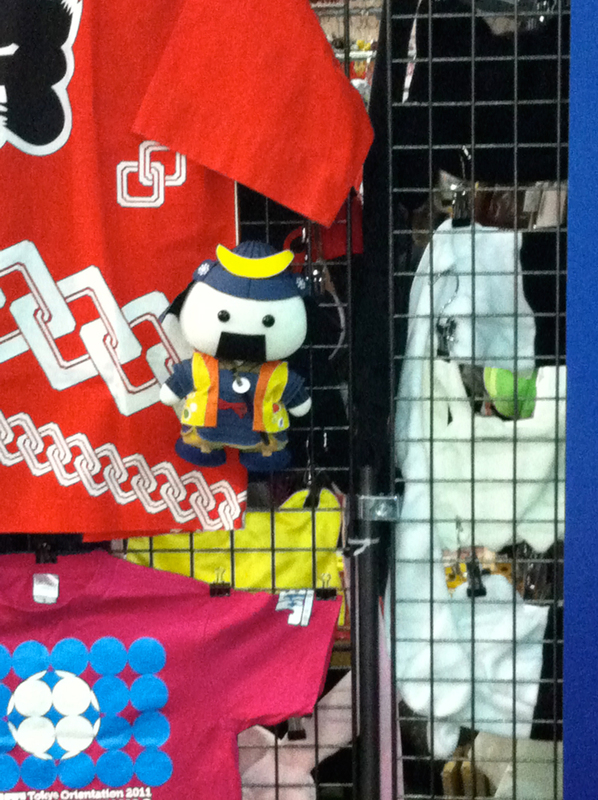 In the corner are the freebies from Toei's booth. 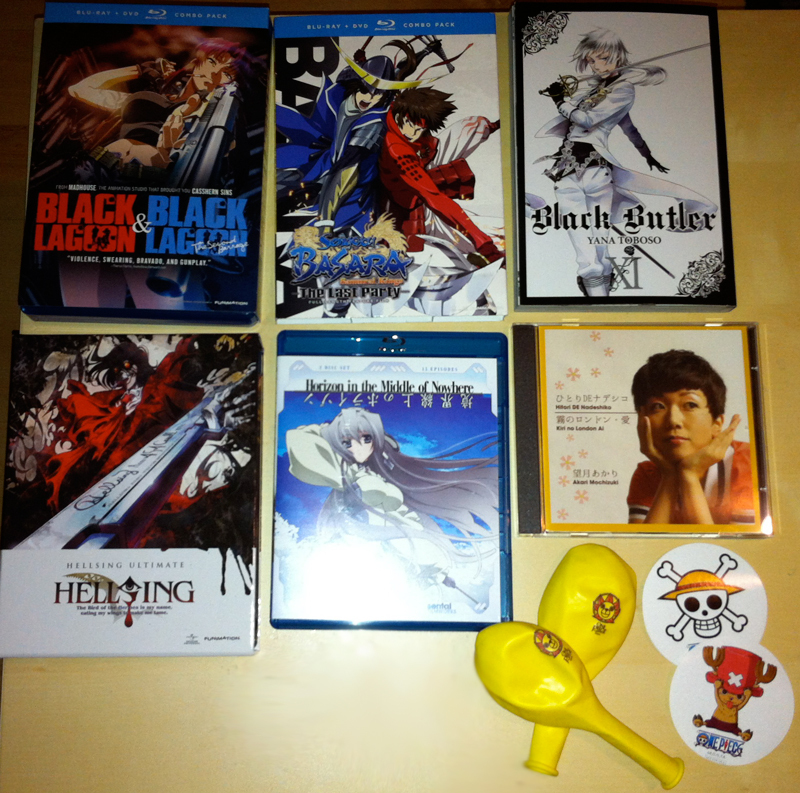 Anime, manga and music purchases. All in all it was a good day out. Arriving just before the doors opened was worth it as it was already getting very crowded well before we left in the early afternoon. I'm not sure if we'll become regulars, but if Hyper Japan manages to arrange guests of this quality in future then we might well return!